Currently in beta but everything should work! Almost out of beta :O and into a full release. - Eats food automatically once you set it in the settings, this will NOT work in combat unfortunately due to it using a protected function ( which I can't do in combat with UseItem for some reason ). I looked high and low for it to no avail for an eat function, not giving up, I have about 3 more ideas to test. - Repairs armor with kits automatically for you once they hit a certain threshold you set, this works in combat WHEN the durability updates which is the same for when ESO will calculate the combat difference. - Auto charges your weapons once they hit a certain threshold you set, this works when charged are changed ( i.e. you smacks something that has an enchant or your weapon abilities proc it ). - Hides if not in hud/hudui scene, unless you are changing a setting that requires you to see them, then it will show you so you can make sure you get it just the way you want. - You can group them, or separate each thing ( resources, durability, and charges ), and you can remove any and all from view. What about chat window logging? - Off by default but there is a setting that will tell you when you are going to eat food, need to select a food, repair and charge. Check if we have initialized before processing events. Fixed bug if you didn't have settings loaded when you load settings and didn't parse the bag again you couldn't choose the food in your bag until it parsed again... basically it should always show now in the dropdown. 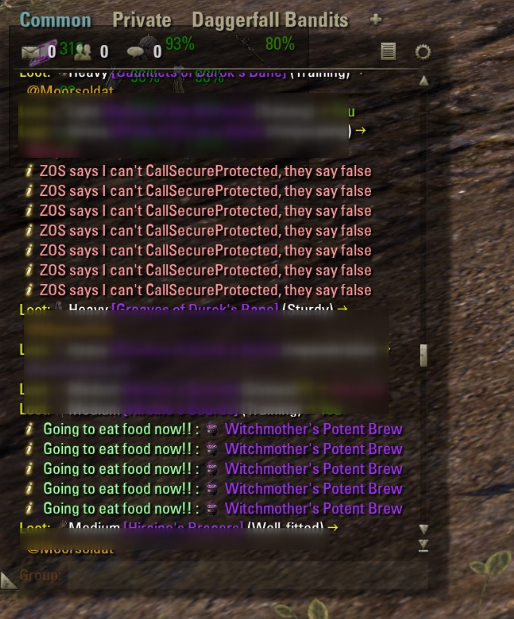 Checks IF I can call the SecureProtected Function and if not it will tell you ZOS says no >_>, currently there is absolutely no way I can get around this. Actually make the ui better this time. Fix weird log error with food. Food fix -> If you are combat, stop telling me you are going to eat because you can't eat while in combat, well, the player can, but I can't call this protected function in combat. -> Update item condition when you die, this is a frivalious call that will probably never need to happen, will probably be removed next version because it should happen with a durability update. Clarification on combat repairing and a crash you may have seen in v0.1 or other add-ons with similar functionality. The bug is related to trying to repair while durability is changing and the durability is being updated by multiple sources thus resulting in a crash because two informations are no longer synced I'm assuming it hits an assert of some kind somewhere, but anyways, the solution is to simply wait for the code to finish executing, which while isn't a solution for most threading issues, this should suffice for this simple case, especially since I'm giving it a time out, it can only call the function x amount of times per interval, so if it tries through whatever other method, it won't spam it, only one event will go through, which, will be the event you actually WANT to go through. We only get durability updates whenever a unit's state changes, whether this is the player's or an enemy dying or reviving or in combat or out of combat, it seems to happen on any of these events. Not only is the event not sent, but the item condition is not updated for the item until such an event occurs, however, this does mean it CAN repair in combat, you just need to make a unit change it's state, what all states you ask? I have no idea, I need to do more research, but for the time being this is what I know. On the flip-side enchants seem to work flawlessly 8D. Next update will consist of UI updates and pvp/pve food choices. I was wondering if you could add an option to auto-repair when accessing a npc vendor/merchant? sometimes during a AFK break in a trial it's convenient to port back to the entrance to clear inventory and do a repair at the vendor. - sometimes food is not consumed when there is no effect from other food. I must consume it manually. - maybe instead of checkbox "Dungeon only" make two dropdowns with food? It will be useful for me. I change it manually now. That's interesting, I know sometimes it won't eat food if you are doing x thing like fishing, dying your clothes, or if you are in combat or lockdown because of ZOS but, it's such a weird thing with it being a protected function. The dungeon thing I have an idea for that that will go just in line with what you want, basically, as you say. .
Let me know if 0.5.1 fixes it, I actually have never gotten that error, it's like you are getting an inventory update before you have even been activated which doesn't make sense but, I'm checking that you are init now, if you get it again please let me know and let me know under what exact situations it occurs. I saw the first block in the battle (I think). Messages of the second block were repeated at the same time several times. Yeah I'm getting that too... I have an idea but I'm not sure yet. I made new food but dropdown has not been updated in settings (0.4.1). So it's because the settings haven't been loaded yet, so, if you open auto settings, then create food you'll notice it updates, but before you open the settings the values are whenever the addon loads, I think I know how to fix this, thank you for bring it to my attention!! Version 0.5 should fix it!! Hmm... I think the bag hasn't parsed yet for some reason, I recently traded with a friend and it didn't update, but the next time my bag sent an update it was there, I have an idea why, thank you for letting me know! 2. In other char settings? Implying a diff char? The settings are currently user, not account-wide, and also if you were to use the same food setting account wide, that would be a bit interesting to try considering you'd have to have the same food and also the bag/slot id but i think i already handle the latter case... I'll play around with it. Oh, I checked and it's a message from other addon. Sorry. I thought that I turned off it. Auto is the best. Thanks for this work. :O Thank you so much! Last edited by zelenin : 11/26/18 at 12:19 AM.